Yay! Wonder is available on Blu-ray and DVD now! We are so excited to finally be able to watch this movie at home, it’s a favorite of ours and it has such a wonderful message! Featuring Julia Roberts, Owen Wilson, and Jacob Tremblay this is an inspiring story of a loving family whose son, born with facial differences, enters a mainstream school for the first time. Based on the beloved best-selling novel, WONDER follows the inspiring story of the Pullman family, whose youngest child, Auggie, is a boy born with facial differences. When Auggie enters mainstream elementary school for the first time, his extraordinary journey unites his family, his school, and his community, and proves that you can’t blend in when you were born to stand out. 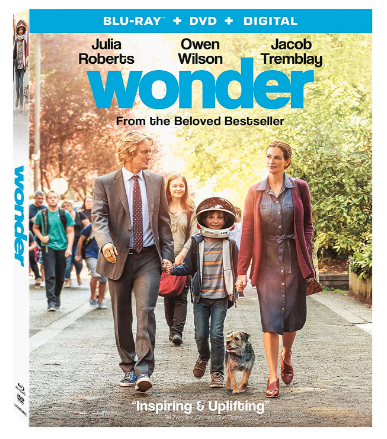 Oscar® winner Julia Roberts, Owen Wilson, and Jacob Tremblay star in this heartwarming and uplifting film. This is SUCH a great movie! I love the message and there are so many wonderful family conversations that can come from watching this movie together. I’m excited to share that ONE lucky She Saved reader (US only) will win a digital copy of WONDER along with a fun prize package that includes: WONDER NIGHTLIGHT NIGHT SKY PROJECTOR, WONDER INSULATED LUNCH BAG, WONDER FISH EYE LENS and a WONDER FIDGET SPINNER. I love that Julia Roberts stars in it. Looks like a great movie! Me too Amy, and she's so REAL in it, you will love it! I really love Julia Roberts as an actress, starting with Pretty Woman through her current roles. I actually haven't been able to see it yet but I loved the book. I like that it encourages acceptance. i havent seen it yet, but it looks like there are some good tearing up moments. I love this movies message about acceptance. Thanks for the giveaway. I hope that I win. I love the amazing cast and of course the story about a boy who may look different but despite that he is still a wonderful boy full of heart and he is just like anyone. I love the theme of this movie and Julia Roberts is one of my favorite actresses. I love the story and the cast.